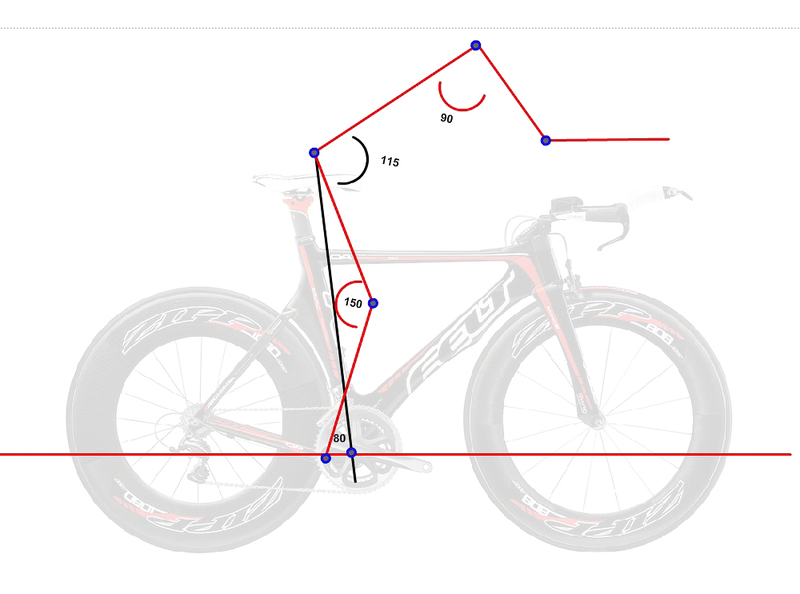 In this blog I am going to explain some fundamentals of triathlon bike fit. Along the way, I will explain how a road bike can be successfully configured for triathlon use, but why a road bike should never be converted to a true triathlon fit. What follows can largely be considered an illustration of work by Dan Empfield, whose writings at slowtwitch.com should be consulted by anyone looking to explore the subject further. Please note, images are not to scale. 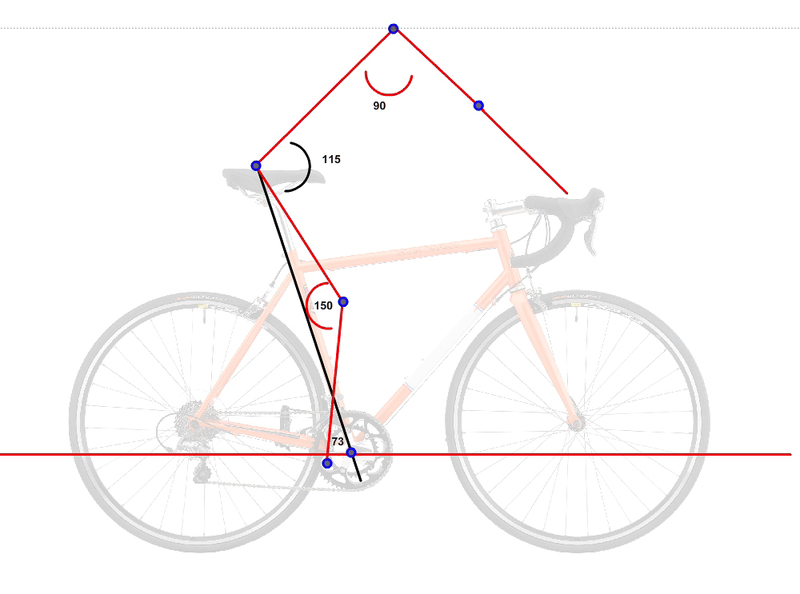 The angles depicted are for illustrative purposes and do not indicate “proper fit” for any given rider. Above we see a rider in a traditional road position. The angle at the intersection of the black and red lines is called the “hip angle.” Hip Angle is measured from the clavicle to the center of the bottom bracket with the ball of the hip (greater trochanter) as the axis. 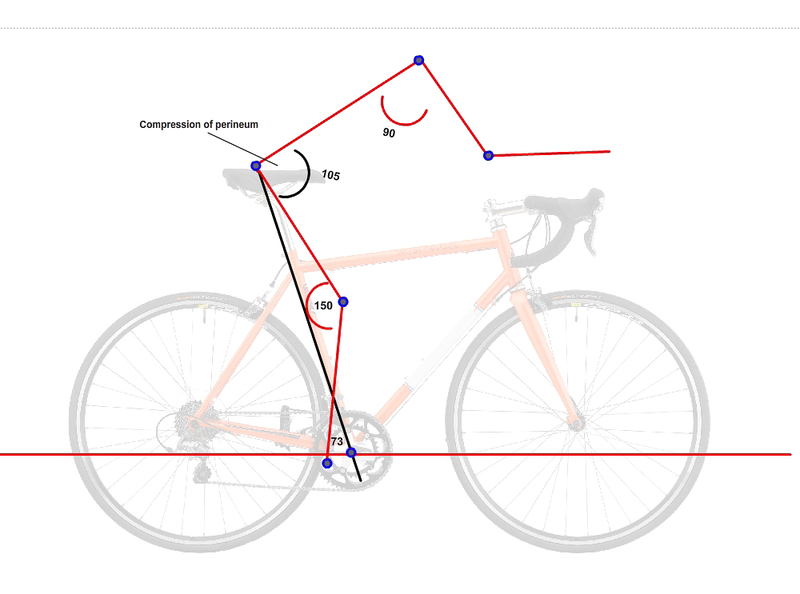 (“Hip Angle” is another way of referring to “drop,” or how tall the handlebars are relative to the saddle.) Many riders – and some fitters – believe a triathlon fit involves simply putting on aerobars, creating a smaller hip angle and thereby lowering the rider’s frontal profile. 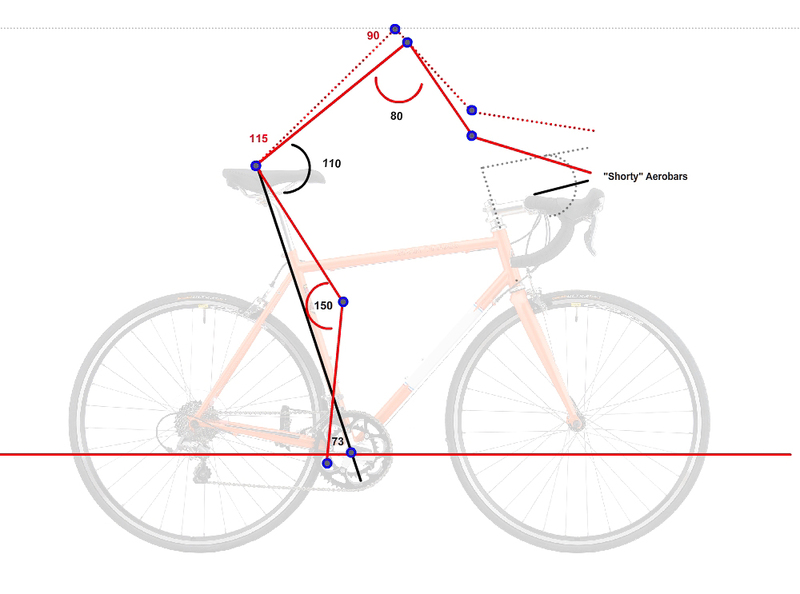 A true triathlon bike fit, however, does not require a change in hip angle. The rider above is the exact same as in the first image, but rotated forward 7 degrees from the bottom bracket of the bicycle. The hip angle remains unchanged from the road position, but after rotating forward, the rider’s shoulder has dropped considerably below the dotted line that had intersected the clavicle. The forward rotation, not a reduced hip angle, creates a lower frontal profile and a reduction in drag. In general, a fit triathlete will decrease his or her hip angle an additional 10-15 degrees from the road position, but many successful age groupers retain a hip angle fairly close to that of a road bike. Final hip, knee, and shoulder angles are often within just a few degrees of the road bike. The image below, for example, shows the final numbers from a recent fit for a member of the Duke University triathlon team. 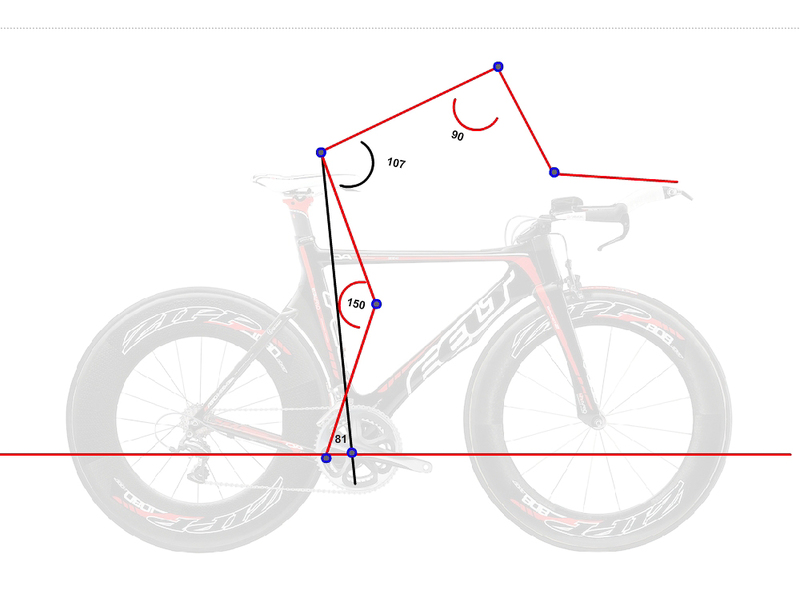 If we simply rotate the rider forward as we did on the triathlon bike, the rider will have far too much weight over the front wheel and the bike will become unstable. Alternatively, if we simply install an aero bar on a road bike, the rider will need to reduce his or her hip angle, which will compress the perineum, the soft tissue at the groin. Pressure on the perineum can cause numbness and may lead to vascular damage. In addition to compressing the perineum, the reduced hip angle will compress the diaphragm making it more difficult to breath. While a road bike may not accommodate a true triathlon fit, many riders compete successfully in triathlons on road bikes. Road bikes are especially good over shorter distances where aerodynamics are less important or on hilly or twisting terrain where a triathlon bike may not provide optimum handling. When using a road bike for triathlon, we recommend maintaining a position that retains the comfort and versatility of a road bike, even if it sacrifices some of the all out speed of a dedicated triathlon rig. In the “compromise” triathlon position above, the rider uses “shorty” aero bars which usually do not extend much beyond the brake hoods. The position typically requires a smaller shoulder angle, which may create stress in the neck and shoulders. 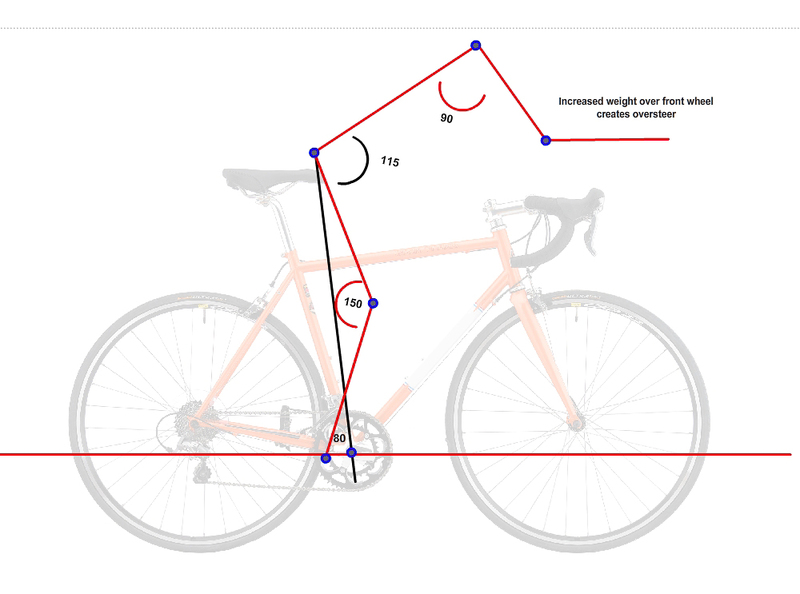 A slightly taller and longer stem generally will allow a rider to maintain a larger shoulder angle [dotted line], but may compromise the bike’s handling. (Consult with an experienced fitter before altering bicycle stem length.) The compromise position may include a slightly steeper hip angle or slightly steeper shoulder angle, but the rider remains essentially in a road bike position. Most of the aerodynamic benefit of the compromise position is attained by narrowing the rider’s frontal profile rather than by lowering it. I hope the above has been a good introduction to the basics of triathlon fit. As always, whether being fit at Durham Cycles or anywhere else, bicycle fit is a dynamic process that requires rider feedback over time. Some fit issues will require the expertise of a trained medical professional. The staff at Durham Cycles are not medical professionals and do not claim to offer medical advice. If you experience pain, numbness, or physical discomfort during or after riding a bicycle consult a physician. DO NOT ride through discomfort. Durham Cycles is Fit Kit Level 3 certified, but does not endorse any commercial certification program.